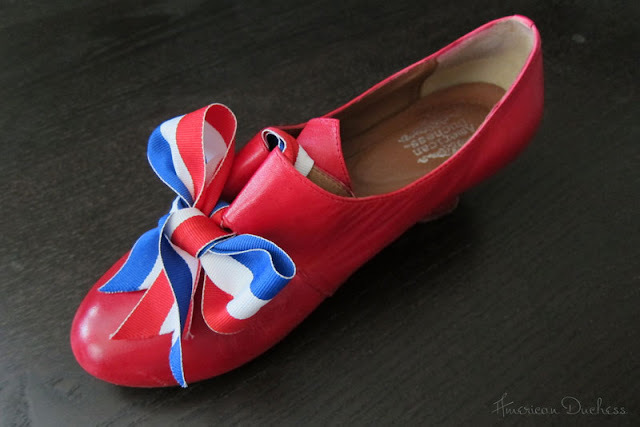 Question: How do I install the bows on my 18th century shoes? A pair of 18th century latchet shoes, such as the Georgianas. First, adhere your velcro tabs. 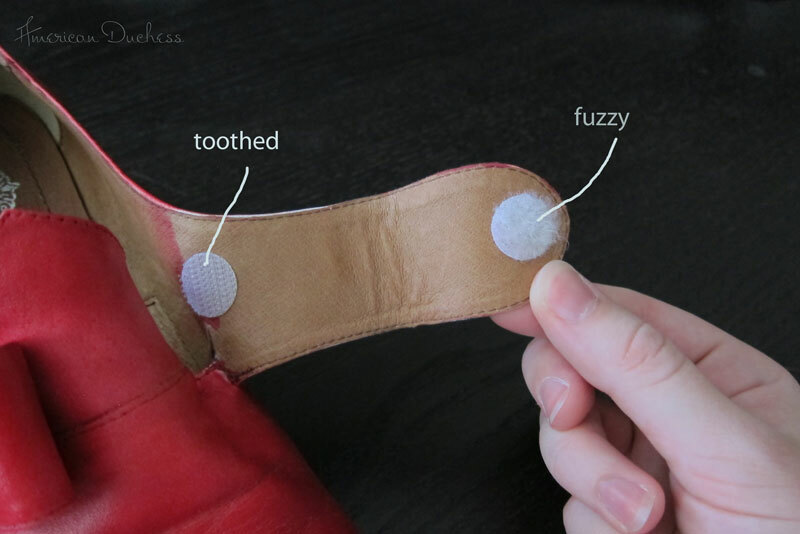 I recommend adding a dot of leather glue even if your tabs are stick-on, to keep them from "migrating" on hot, humid days. On the underside of your latchets, stick the fuzzy side of the velcro to the end of the latchet, and the toothed side of its mate to the base of the latchet, near your foot. Do this for both latchets. Tie in a bow or a decorative knot. 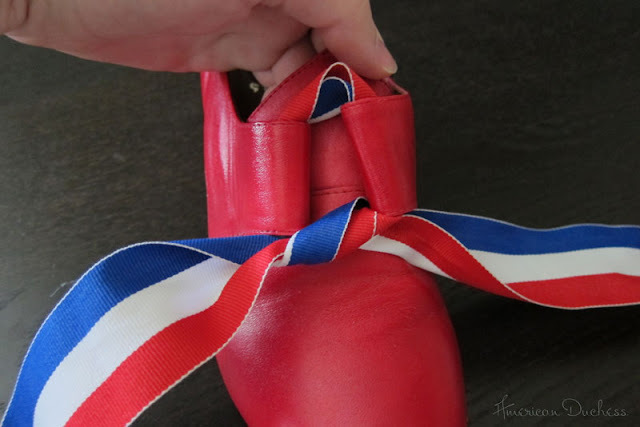 You can tie the ribbon over the toe or at the top of the foot; there's no right or wrong way to do it. Voile, that's it! 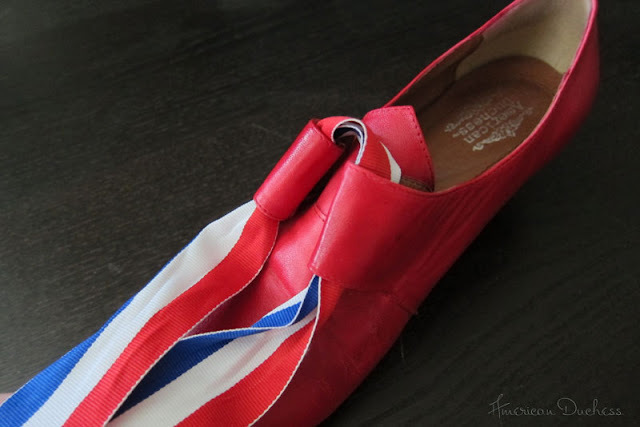 If you decide to wear your latchets with buckles, you can do so without the velcro being seen or causing trouble. 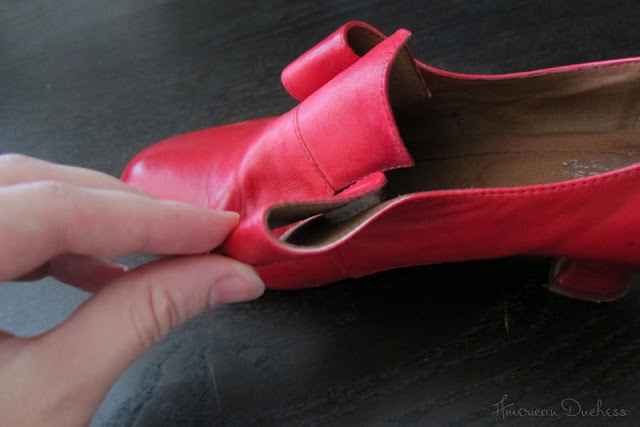 If you don't care about buckles and will always wear your shoes with loops and ribbons, you can permanently stitch your latchets into loops (you'll need a little muscle, strong thread, and an awl to do it), and not worry about anachronistic velcro. Thanks!!! I was wondering that very thing today. BTW, I loooove my shoes. They are wonderful! When taking down the Revolution in Fashion show at FIT in New York, a colleague and I photographed construction details on most of the pieces. When we got to a lavender satin court suit, I examined inside the knee bands of the breeches, and found an inch wide strip of a stiff, black hairy fabric, and whooped, "Ohhhh look at THIS-- 18th century Velcro!" What it actually was was a horsehair fabric, installed with the hairs pointing up, to help the gentleman keep his stockings neatly in place. But it sure looked like Velcro!